It was yet another busy week of activities for the 8th Annual UsuryFree Week from November 13th to 19th, 2012. The pre-launch of the 8th Annual UsuryFree Week was an event in Kitchern, Ontario titled “The 5th Annual Economic Forum.” This event was scheduled for Saturday, November 10th, 2012. The keynote speaker was Ann Emmett of COMER (Committee for Monetary and Economic Reform). Ann focused on the Bank of Canada by featuring updates on the current court action being taken against the Federal Government regarding their irresponsible monetary actions. A Statement of Claim by COMER was filed in December 2011 against Her Majesty the Queen, The Finance Minister of National Revenue, The Bank of Canada and The Attorney General of Canada to restore the Bank of Canada to its original purpose. On Monday evening, November 12th, usuryfree creatives were invited to attend Sydney White’s lecture at the Free University of Toronto, about “Understanding the First, Second, and Third World Wars” as part of her ongoing series titled “Studies In Propaganda.” Sydney focused on the insanity of war and how the global banking cartel profit from all wars by craftily funding both sides - but offering just a little more funds to whomever they choose to be the victors. On Tuesday, November 13th (UsuryFree Day), usuryfree creative were invited to the Conspiracy Culture Bookstore in Toronto, Ontario, Canada for the official launch of the 8th Annual UsuryFree Week. Two guest speakers shared the stage. David Kevin Lindsay from British Columbia and Rocco Galati from Toronto. David Kevin Lindsay’s presentation focused on the evil and immoral effects of the design flaw of usury. On Wednesday, November 14th, John Turmel and myself we guest speakers at the HomeGrown Hamilton in Hamilton, Ontario. Canadian Awareness attended the event and posted this video clip from the event. "The 8th Annual UsuryFree Week, 2012, Hamilton Event." John Turmel introduced the Gold Nugget Network, an innovative, universal coupon concept that can be implemented anywhere. More details at this website: The Gold Nugget Network. There was also an event in Colorado, USA on Friday, November 16th where the musical group, The WanderingMonks, Mountain Hours and Mile High Hours were awarded a Winged Lion Awards for their enthusiastic support of usuryfree living in 2012. On Saturday, November 17th, usuryfree creative were invited to attend the AGM of the Landowners’Association of Ontario. A series of speakers addressed a variety of topics BUT the key topic seemed to be understanding “property rights” and how they are currently in jeopardy. The FamilyLife Foundation – a co-sponsor of various events for the 8th Annual UsuryFree Week hosted usuryfree creative for discussion on Friday, November 16th. The Family Life Foundation - a duly registered charitable organization, founded by Rev. Lindsay King in 1974, has been co-sponsoring events with the UsuryFree Network since the very first UsuryFree Week in 2005. During the 8th Annual UsuryFree Week, numerous Winged Lion Awards were bestowed on individuals and/or groups for their ongoing efforts to help usher in a new age of usuryfree living for everyone on planet earth. This year Winged Lion Awards were earned by usuryfree creative in Canada, USA, Philippines and Malaysia. Perhaps the most exciting event of the 8th Annual UsuryFree Week was the official launch of the Year of UsuryFree Living. Lots more relevant information is detailed in this article: "Real Reflactions On The Year Of UsuryFree Living." As the 8th Annual UsuryFree Week ends, preparations are being made for the "3rd Annual World Conference on Riba" scheduled for November 26th and 27th in Kuala Lumpur, Malaysia. During the Year of UsuryFree Living, it is our intention to raise the awareness of the possibility and probability of we-the-people experiencing a usuryfree lifestyle in 2013 and beyond. Throughout the Year of UsuryFree Living, we - the usuryfree creatives will continue to share our message about the possibility of everyone experiencing the reality of usuryfree living and we encourage usuryfree creaives everywhere to launch their economic lifeboats - a usuryfree time currency - in their respective, local communities as the last, best hope to free ourselves from the ultimate, economic slavery that the New World Order advocates (usury bankers) are planning for our future generations. 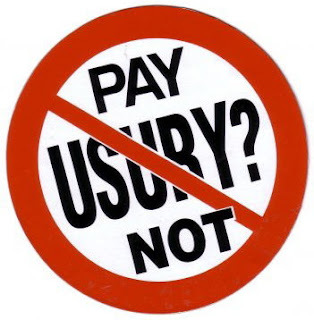 NOTE: On Novemeber 24, 2010, Eleanor Grant published this review of the 6th Annual UsuryFree Week with the title: "Islamic Banking - UsuryFree Week Celebrated."